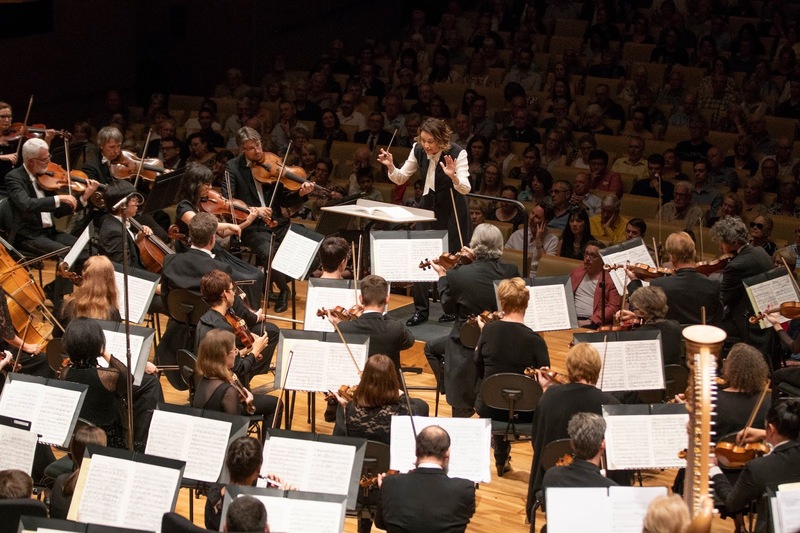 Alondra de la Parra conducts Queensland Symphony Orchestra. Photographed by Peter Wallis. Queensland Symphony Orchestra’s Alondra Conducts Mahler 3 was exactly, wonderfully that – Music Director Alondra de la Parra conducted the QSO, as well as guest mezzo-soprano Lilli Paasikivi and the Women’s and Children’s Chorus from Voices of Birralee, in a spectacular performance of Gustav Mahler’s colossal third symphony. 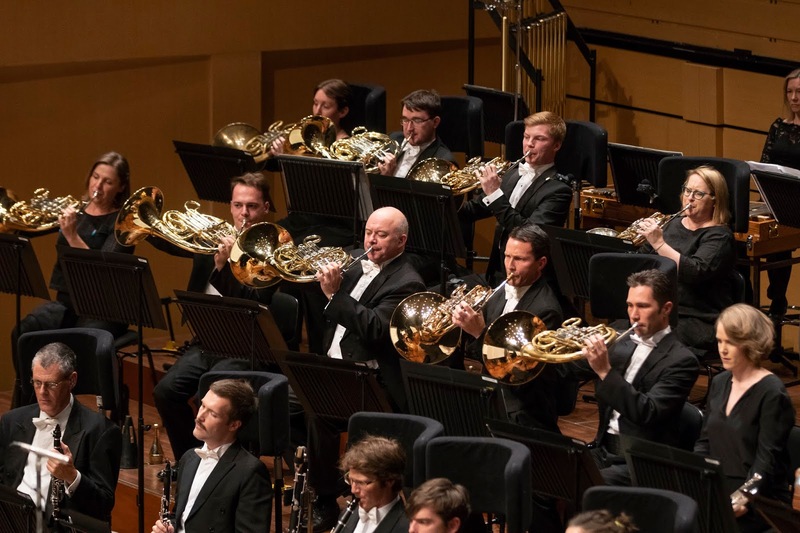 Described as an ‘orchestral guide to the universe’, Mahler 3 is an enormous undertaking. 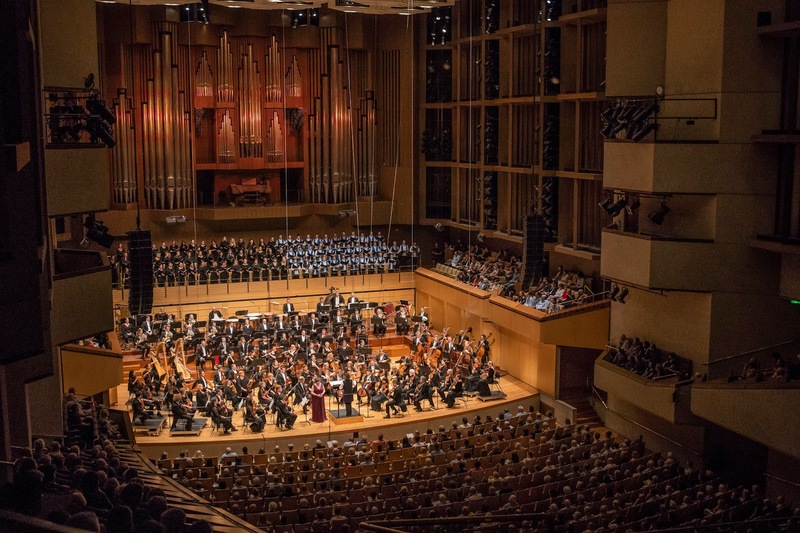 Over 200 performers took to the QPAC Concert Hall stage for the symphony in six movements, playing for over 100 minutes. Speaking before the performance, Alondra referred to Mahler 3 as “a stunning and monumental artwork” and expressed her delight at being able to conduct it as her final concert of the 2018 season. Alondra Conducts Mahler 3. Photographed by Peter Wallis. Mahler said that a symphony, like the world, must contain everything, and his third symphony certainly contained many emotions, sounds, and ideas. The six movements progress through stages of creation from the raw cosmic forces of nature to plants, animals, mankind and all the way to boundless, spiritual love. The detailed listening guide, as well as the pre-concert talk given by QSO’s Director of Sales and Marketing (and Mahler fan) Matthew Hodge, provided much-needed context for me, as someone who has not encountered this piece of work before. It gave me a starting point and allowed me to build my own opinions and impressions from there. The symphony’s first movement makes up almost one third of the work – Alondra de la Parra called it a “gigantic beast” – and its title translates to ‘Pan Awakens: Summer Marches In’. Beginning with a French horn solo, the movement evoked an epic battle between winter and summer, each represented by a different musical theme. The clever use of the orchestra’s geography was clear in this movement as different sections are used to give an almost physical aspect to the music as it moved around and across the stage, adding to the impression of a powerful tug-of-war between the seasons. The movement varied widely, from shivering winter to radiant summer and enormous sound to almost silence, building to a soaring, sparkling conclusion. The second movement of the symphony (‘What the Flowers Told Me’) is lighter and the music drifted gently, like flowers swaying in the breeze. In contrast, the third movement (‘What the Animals Told Me’) grew louder and more chaotic as the movement progressed, as if the animals of the forest were running wild, and ended with a crash of percussion. As in the first movement, the music seemed to be ‘passed’ around the stage in the way it is composed for each section and the brief post horn part, played offstage on a cornet, was almost eerie, floating in on “a bed of strings” as Matthew Hodge described it in the pre-concert talk. Lilli Paasikivi performs with QSO. Photographed by Peter Wallis. The fourth movement slowed in pace and regained the audience’s full attention in doing so. Lilli Paasikivi is one of the leading interpreters of the Mahler song-cycles and symphonies, and it was a delight to witness her performance with QSO – she directed her gaze across the entire hall, enunciating clearly and engaging the audience with her movements and gestures. The lyrics she sang were derived from a poem in Nietzsche’s philosophical novel Thus Spoke Zarathustra about deep midnight talking, aligned with the gentle stillness of the fourth movement that evoked the depth and silence of night. 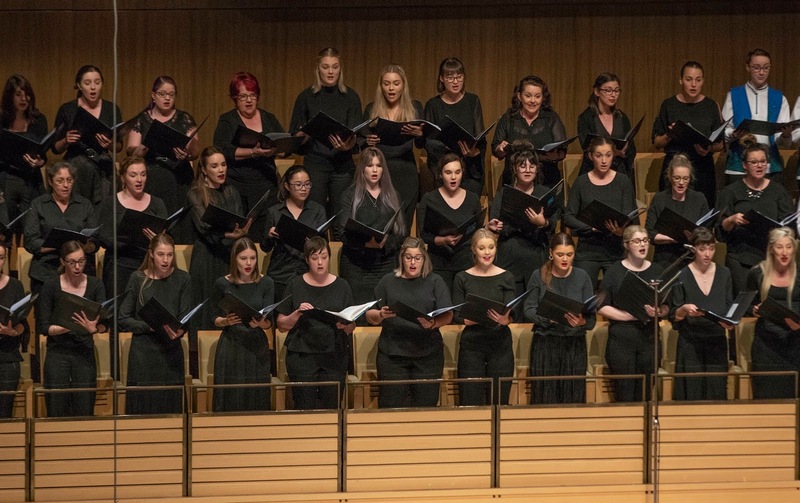 Choirs of Voices of Birralee. Photographed by Peter Wallis. 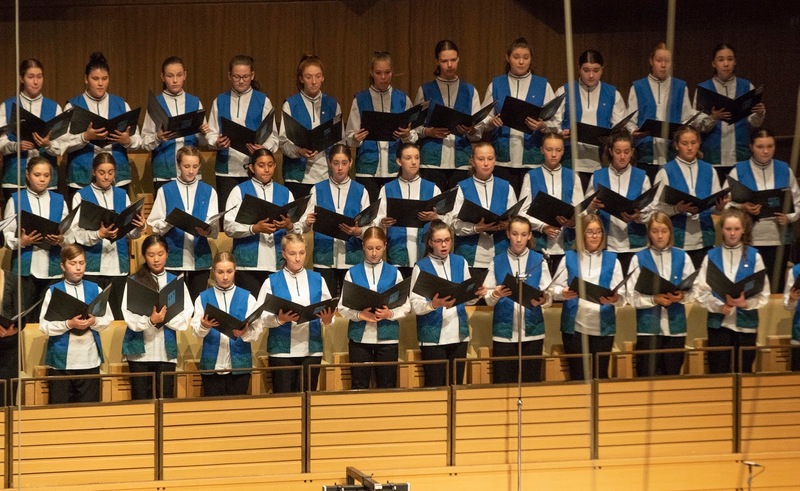 The fifth movement (‘What the Angels Told Me’) introduced the voices of the choirs, which were angelic indeed – the Women’s and Children’s Choruses from Queensland’s youth arts organisation Voices of Birralee, who frequently partner with QSO and Queensland Pops Orchestra. The tension built and Paasikivi and the choirs seemed to answer one another in the music, with the lyrics based on a series of German folk songs that Mahler loved. The final movement (‘What Love Told Me’) returned to the light and shade of the first movement, growing in sound and tension, rising to a thrilling and majestic conclusion. 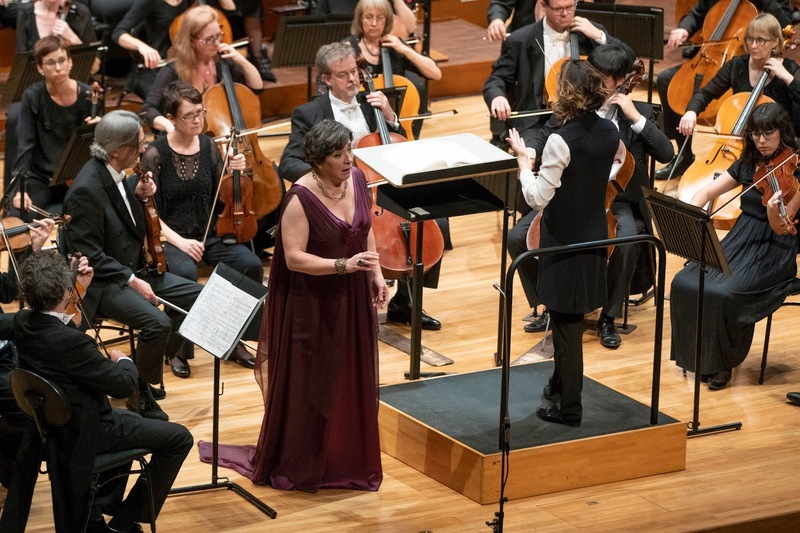 Alondra de la Parra expertly conducted the enormous ensemble with fluidity and energy, often smiling widely – she seemed delighted to be onstage, and entirely in her element with the majesty and enormity of the symphony. QSO and Alondra de la Parra will continue with the Mahler cycle with his fourth Symphony in February 2019. Tickets are available on the website.